I know we’ve touched on this before, but an article I read today reminded me just WHY it’s so important to be your own advocate when buying products, or perhaps a reminder on why to buy fewer products (in a box) altogether. The marketing word “natural” is over used, and under monitored. In fact, there aren’t regulations on using the word at all. It seems the word organic can be used freely as well. Several cereals, many found in the organic section of your local stores, were tested with disappointing results. Cornucopia Institute (www.Cornucopia.org) shared the study late last year. Read the cereal scorecard here. Food that is genetically engineered, is just that… ENGINEERED. Chemically processed to manipulate your mind and body, and we’re falling for it when we don’t read what is in our foods – and take the marketing on the box as truth. Often times the food is made addicting, and we crave more of it… but we don’t know why. We just think it’s GOOD. MSG and sugar are infused into these goods, and we’re consuming them left and right. Read up! Let me know what you think. 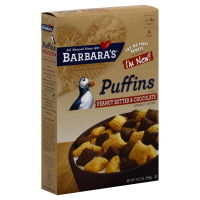 I know we have a few boxes of the Puffins and have also eaten some Kashi cereals as well. Posted on April 26, 2012, in Truth. Bookmark the permalink. Leave a comment.